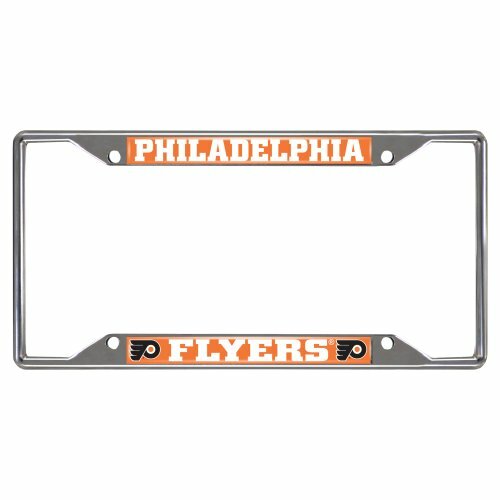 FANMATS NHL Philadelphia Flyers License Plate Frame is the perfect way to accessorize your car or truck and show team pride. Goes perfectly with the mirror and metal style license plates. Crafted from durable, long lasting chrome metal - it resists the elements regardless of the weather. Features an eye-catching display of your team name and logo in true team colors. Fits perfectly around the team inlaid license plate or around your state issued license plate. Each frame measures approximately 12.25 inches long by 6.25 inches tall. Customize your ride and announce your team spirit with pride.